Under the indifferent eye of the international community and in blatant disregard of numerous international legal provisions, Iran is implementing its sectarian agenda and pursuing its expansionist tendencies in the Arab region in total impunity. At the same time, the already dire human rights record of the country is being further worsened by the systematic and reckless oppression perpetrated by the government against ethnic and religious minorities. In fact, in Iran, Hazaras, Pashtuns, Balochs, Azeris, Baha’i, ethnic Arabs and non-Shiites are subjected to various human right violations, including forced displacement, mass killings, torture, denial of the right to education, and exclusion from the healthcare system. Furthermore, minorities are forced to live in highly polluted areas, and are denied the right to freedom of expression and peaceful assembly – with the government systematically detaining and prosecuting journalists and peaceful protestors. Ahwazi Arabs living in the Al-Ahwaz province are one of the most targeted groups. Annexed in 1925, this oil-rich area is one of the poorest and least developed in the country, since the central government is exploiting all natural resources and excluding Arabs from the workforce – thus widening the economic cleavage between Arabs and ethnic Persians. Arab citizens are constantly subjected to abuses and violations of their basic rights, and are systematically excluded from the education system and the job market. Furthermore, all peaceful protests and awareness-raising campaigns are brutally suppressed. This side event aims at shedding light on these sectarian and discriminatory policies, and at identifying viable solutions to halt the systematic oppression of ethnic and religious minorities. 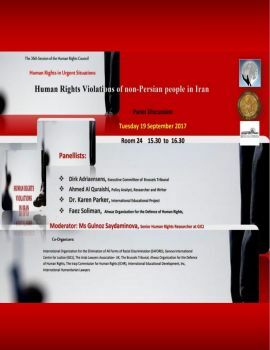 As the Iranian government is constantly and blatantly breaching international law and international human rights law, the United Nations and all its competent mechanisms should take urgent action to prevent the situation from worsening and to ensure accountability for all the human rights violations committed.